© 2018 Scratchu.com Pattanapravesam | Mohanlal, Sreenivasan, Karamana Janardanan Nair, Ambika, Thilakan, Azeez, K.P.A.C. Lalitha, N.L. 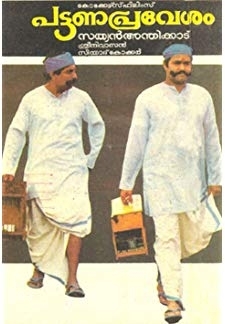 Balakrishnan, Paravoor Bharathan, Philomina, Innocent Vareed Thekkethala, Mammukoya, Mala Aravindan, Prathapachandran, Oduvil Unnikrishnan - Pattanapravesam (1988) | Malayalam Movie | 8.1/10 | Synopsis : Six months after the events of the prequel (Nadodikattu), C.I.D. officers Ramdas (Mohanlal) and Vijayan (Srinivasan) are called to Kerala to find the murderer of a police officer. The two ... ... Watch Online!! !